Camp Able Sentry, located near the FYROM capital of Skopje, served as an intermediate staging area for all military forces deploying to the forward area of Task Force Falcon in Kosovo. 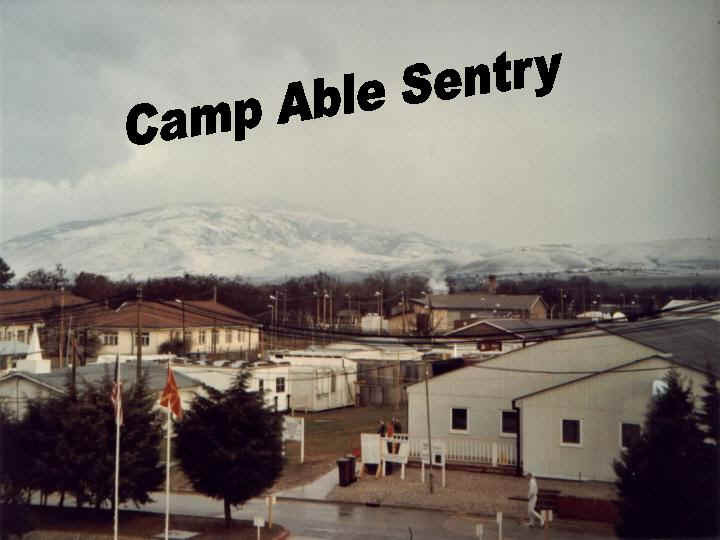 The 250 acres of Camp Able Sentry (CAS) became the Receiving, Staging, and Onward Movement (RSO) site for Operation Joint Guardian in the Balkans. Force protection at Camp Able Sentry was improved with upgrades to security at the front gate and new perimeter lighting. With supplies and troops flowing smoothly to Kosovo by other means, Army officials declared this camp obsolete and the mission complete. The Army began packing up in December 2002 and planned to be gone by 01 January 2003. US officials did not closing the camp entirely. The 370 soldiers and Department of Defense civilian workers left behind between 150 to 200 civilian contractors to take care of the base in case its needed again. 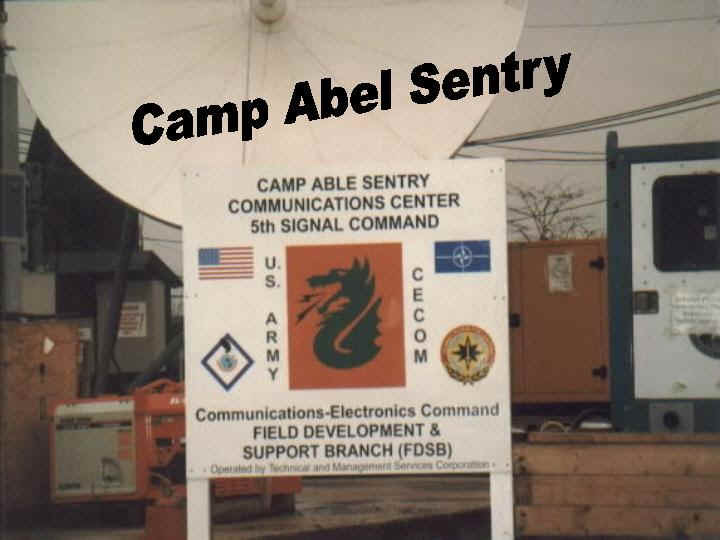 After almost 10 years of being an Intermediate Staging Base for the Balkans, Camp Able Sentry (CAS) will became a warm base by the first of 2003. The base provided logistical support for U.S. operations in Albania, Bosnia, Bulgaria, Kosovo and FYROM. It was closed in phases. With the closing of CAS, approximately 650 local national and contracted jobs will be terminated. However, the civilian contractors are trying to find new jobs for as many of employees as possible in the Kosovo theater, said Gallucci. As of Jan. 1, 2003, the base went to "warm base" status, which means it will be maintained by a small group of civilian contractors in case operations need to be reactivated in the area. 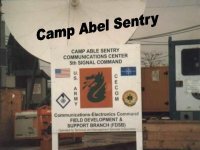 Camp Able Sentry has been around since 1992, so it offers soldiers more amenities than other spots around the world. For instance, each soldier has a room to sleep in, rather than a tent, and most of those rooms have air-conditioning. Also, the camp has laundry services, a post exchange, a club called "The Swamp" (where soldiers can go to drink "near beer," play pool or catch a movie), a 24-hour dining facility, a chapel, a sporting area with volleyball nets and horseshoes and a fully stocked gym. 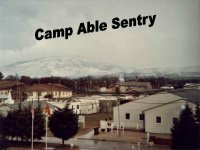 Camp Able Sentry, established in 1992 during the Bosnian War, functioned as a major logistical hub for five Balkan nations during three regional conflicts over the past decade. The camp supported Operation Joint Endeavor into Bosnia and Herzegovina in 1995, Operation Allied Force to prevent Yugoslavia's ethnic cleansing of Albanians in Kosovo in 1999 and Operation Essential Harvest to disarm Albanian rebels in northern Macedonia in 2001. Additionally, the camp supplied US forces in Albania and Bulgaria over the years. The Pristina, Kosovo, airport now supports the on-going operations in Kosovo. Task Force Fox, the NATO mission in Macedonia, has its own logistical capabilities. U.S. forces leave behind British, Finnish, Irish, French, Spanish, Polish, Swedish, Italian, Belgian, German, Austrian and Hungarian forces in Macedonia. Since July 1993, the United Nations conducted peacekeeping operations in the Former Yugoslav Republic of Macedonia (FYROM). A 500-soldier US battalion supported the mission from Camp Able Sentry and 12 outlying observation posts along the northern and northeastern borders of Macedonia and Serbia. A Nordic battalion shares the U.N. mission within its sector west and southwest of the US battalion Task Force Sabre, originally known as Task Force Able Sentry (TFAS), consisted of approximately 620 soldiers and a US helicopter detachment located at Camp Able Sentry. TFAS was the US Army's task force attached to the United Nations Preventive Deployment Force (UNPREDEP) in the Former Yugoslavia Republic of Macedonia (FYROM). UNPREDEP was originally established in July 1993, to monitor and report activity along the FYROM-Serbia border area that could undermine confidence and stability in the region or threaten the territory of FYROM. In April 1996, as part of a major initiative to improve a quickly deteriorating situation, the US Army Europe (USAREUR) commander approved the allocation of $3.2 million to improve the base camp and seven OP roads. Since the task force staff could not manage all of these projects, both the Facility Engineer Division and the Military Engineering and Topography Office of ODCSENG, HQ, USAREUR, supervised project management. Started in July 1996, the road upgrades were completed in November. The first phase of base camp improvements was finished in December; the second phase was completed by the end of March 1997. Task Force Hunter was organized around a Hunter Unmanned Aerial Vehicle (UAV) Company from a Forces Command (FORSCOM) Corps Military Intelligence Brigade (MI Bde). It deployed into Camp Able Sentry, Macedonia, in March 1999, to provide imagery intelligence (IMINT) in support of NATO's Operation ALLIED FORCE (OAF), the air campaign designed to force the Serbian Army to withdraw from Kosovo. The UAV task force flew 246 sorties, totaling 1,357 flight hours, while supporting Joint Task Force Noble Anvil (JTF-NA), and later Task Force Hawk with real-time IMINT during OAF. Although the UAV Company had performed extremely well during exercises at the National Training Center, it proved itself for the first time in a contingency operation as an invaluable and reliable intelligence asset to commanders at all levels. It flew more flight hours than any other NATO reconnaissance platform.